Schwerin reminds me a lot of other former-Eastern German cities I have visited, most notably Erfurt, with respect to the way they have recovered since reunification of the country. Schwerin has been rebuilt, refurbished, and repackaged into a glorious lakeside city/town that is absolutely worth a visit. I used the term 'city/town' because while it is a city -- a provincial capital at that -- it is not a very big one, and its reconstruction made certain to emphasize its natural lakefront beauty. While there have been some modernization projects, they don't detract from the city's character. 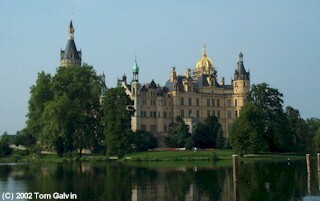 As for character, Schwerin has quite a lot, starting with its magnificant castle. 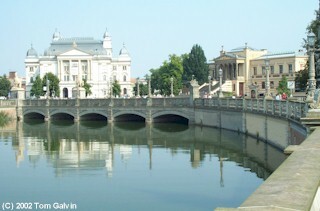 As the first picture suggests, the castle sits on an island in the lake, connected to the mainland via only two bridges. It is a colorful structure that serves two purposes -- as the provincial seat for the German state of Mecklenburg-Vorpommern (Lower Pomerania), and as a royal museum, celebrating the state's past as part of Prussia. Among royal castle exhibitions, Schwerin Castle is one of the better ones. I particularly enjoyed the throne room, which was not overly huge but elaborately decorated with the crests of the province's cities all across the ceiling. In the adjacent rooms are wall portraits of the Mecklenburg kings and queens. (Unfortunately, the portraits weren't what I would call impressive, and I can derive three possible explanations for this opinion: the portrait artists weren't that great, a significant number of Mecklenburg royals were truly ugly and fat, or the local fashions left a lot to be desired. Some of them were unbelievably awful.) Also, look for a separate wing on the first floor with a large and impressive porcelain exhibit. It's easy to miss, and is included in the entrance fee. The rest of the old city is fairly compact. The second and third photos show the other key attractions. The former has the Schwerin Bridge, the Theater at left, and the State Museum at right. 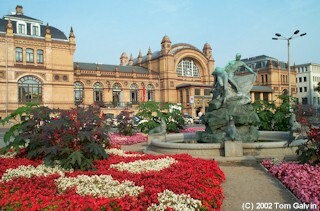 The State Museum is primarily an art gallery, concentrating on Dutch and German paintings. The Bridge is one of two connecting the Schwerin Castle to the mainland, the other led to the Castle Gardens to the south. I took the second picture from that bridge. 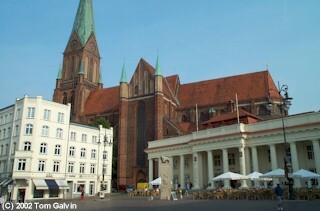 Meanwhile the latter shows the Schwerin Cathedral looming over the town hall square -- I took that shot from right in front of the Tourist Information Bureau before the Saturday noon crowd started to gather. You can tell from the brightness of the buildings that this part of town was recently renovated. Indeed, that was one thing that impressed me about the town, that the whole altstadt got a fresh coat of paint since reunification. The downtown is almost all pedestrian, like the section of Mecklenburgstrasse shown in the fourth photo. Covering about four city blocks, this zone is replete with shops and hangouts stretching from the waterfront near the Castle to the Pfaffenteich (Pfaffen Pond) in the north. The place looks so new you can almost smell the paint. 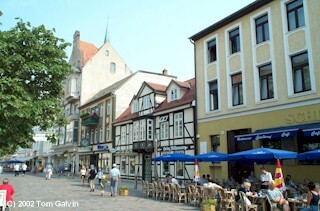 Schwerin's downtown extends further to the west, and the further west you go the more modern you get. Like other former East German cities, Schwerin is home to a brand new and huge three-level American-style shopping mall, with a glass exterior but surrounded by renovated storefronts with more traditional façades. But I was particularly impressed with the friendly people. Schwerin didn't appear to attract a lot of foreign tourists, and I don't believe I encountered any non-Germans in my travels. Certainly as a provincial capital, Schwerin is an important city, but it thankfully lacks the obvious city-like hustle and bustle, and with the beautiful scenery such as I found at the train station (final photo), I had the very strong feeling that the welcome mat was out. Schwerin is an easy place to overlook. Northern Germany doesn't attract foreigners like the south, but if you do head north, I recommend a visit. Or, if you are among the many doing business in nearby Hamburg, you might wish to carve out a half-day and relax at lakeside with a pils and a view of the Castle!